After the incredible product workshop in July, it was time for the most awaited day of the Jisc Edtech Startup Programme – sales day! Day 3: A usual start to the day at EdSpace with coffee, croissants and conversations. With the room full of Jisc staff and 5 high potential start-ups, I was very keen to see how the day unfolds. We started with a quick round of introductions to know the 25+ people in the room – most certainly the biggest gathering in a workshop for us. We quickly went on to a 15 min session with Chris so touched upon the HE & FE landscape with lots of acronyms (UCISA, CISG, HECSU, HEPI)!! We have based a lot of our strategies on representative bodies, think tanks & university groups so it was re-assuring to know that Jisc uses them too. Next up was Niles Newberry to talk about pricing models – the most difficult thing to crack for us (& most start-ups!). This was the first time that the 5 start-ups heard a pricing pitch from one another- I was surprised to see the the similarities & also some smart differentiations each one of us uses – from discounting, freemium to bundling. 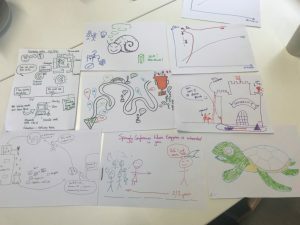 1.Rich picture activity to draw the experience of working with HE/FE organizations. 2. 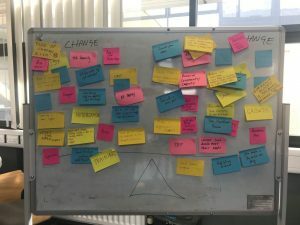 PESTLE Activity to analyze whether should institutions should be open change or not – & what are the key things they might consider in this action. For me the next part was a key highlight – Account management. Andrew shared his top tricks & tips to get to the right person, with the right language & the right time. Considering budgets and understand how it works for Jisc was a gold mine- this will ensure we pitch to the budget holder at the right time. Overall, the learning & practical approach by all presenters was commendable. Being a part of this programme doesn’t mean only attending the day in person – there is so much to take back and put in action! Each conversation has helped us push & think outside the box. The next up is the pitch day to mark the finale of the programme. I think everyone has found a connect to start a on-going journey with Jisc and Emerge. It’s onwards & upwards from here. Millions of students travel the world for education & work. Starting with the UK, Student Circus is re-defining job search for international students. Having experienced the problem first-hand, the founders launched the platform which is now recognised by 100+ universities. We are bringing innovative tech to help universities with data & insights to practically improve student placements in an immigration sensitive approach. Posted by Sue Attewell on 01/10/2018 in Guest blog, Start-up and tagged sales. Could future VLEs spell the end for screen time?